Last year, Huawei took a big shot at Apple with the MateBook X Pro, a laptop that encapsulated some of the best things about MacBook Pro line while ignoring more gimmicky features like the Touch Bar and Apple’s frustrating butterfly keyboard. 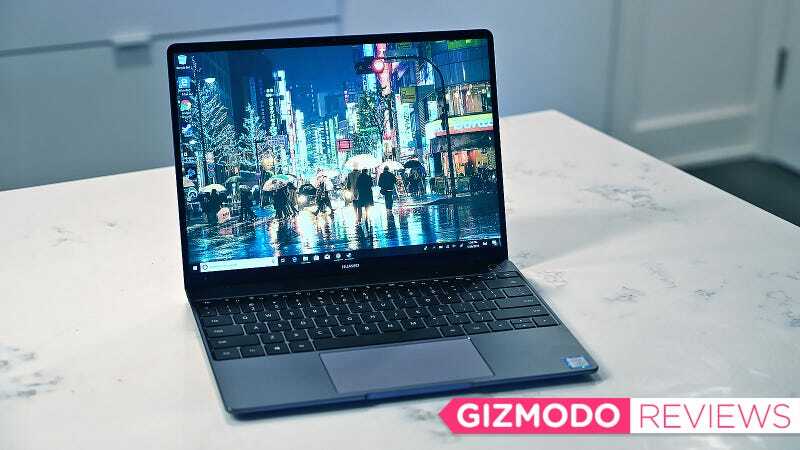 So for 2019, Huawei made a new mainstream 13-inch laptop meant to take down the recently revamped MacBook Air, and aside from one shortcoming, the MateBook 13 outclasses its biggest competitor in nearly every way. From the outset, it’s no secret where Huawei is drawing its inspiration, as the MateBook 13 is an unabashed riff on the MacBook Air. But even though it’s a clone, it’s a good one. The MateBook 13 features a superbly constructed unibody aluminum frame that just so happens to measure in at 0.59 inches thick, less than 0.02 inches thinner than the MacBook Air’s thickest point. That said, because the MateBook 13's body doesn’t have the same tapered body as the MBA, it doesn’t actually feel any sleeker when you pick it up. Also, like the MacBook Air, the MateBook 13 offers two USB-C ports, tough on the Huawei, you don’t get support for Thunderbolt 3. Instead, the port on the left is meant for data and charging, while the right is intended for data and video output. So to make up the difference in the overall usability of the MateBook 13's ports, Huawei is throwing in a free MateBook Dock 2 with every system, which expands connectivity by adding a VGA, USB-A, one more USB-C, and Ethernet. Where Huawei starts to deviate from Apple’s formula is with the MateBook 13's keyboard and screen. Instead of the infuriating stiff and shallow keys you get on modern MacBooks, the MateBook 13 opts for a standard chiclet layout with ample travel and plenty of bounce that leaves you with zero concerns about finger fatigue. And to the top right of the keyboard, the MateBook 13 features an elegant power button with a built-in fingerprint reader that makes it possible to turn on the laptop and log into Windows with a single touch. Meanwhile, the MateBook 13's 2,160 by 1,440 screen offers a slightly lower overall resolution the MBA’s 2,560 by 1,600 Retina Display in exchange for touch support, which bafflingly remains an unattainable option on any current MacBook. And despite my initial concerns about potential lackluster brightness and colors, after using the MateBook 13 over the course of a week, there’s very little to complain about. In fact, despite a claimed brightness of 300 nits, our review unit actually peaked at 356 nits, which is almost 10 percent brighter than what we saw while testing the MacBook Air (327 nits). Though I will say that for optimal performance, it’s best to leave the MateBook 13's ambient brightness option on, as it offers a slightly better experience when the using computer in bright or sunny rooms. The MateBook 13 is about a quarter of an inch shorter and nearly a full inch narrower than the MateBook X Pro. Compared to its slightly pricier sibling, the MateBook 13's smaller 13-inch screen makes it just a tad more portable than the 14-inch MateBook X Pro. The size difference isn’t enough to stop either one from fitting in a bag, but for anyone who fancies getting work done on planes, the 13's smaller dimensions are just enough to make typing on tray tables a tiny bit less objectionable. Thankfully, Huawei kept the X Pro’s 3:2 aspect ratio screen, whose relatively taller dimensions gives a slight boost in productivity over systems with traditional 16:9 or 16:10 screens like the MacBook Air. But perhaps the MateBook 13's biggest advantage over its Mac counterpart is performance. 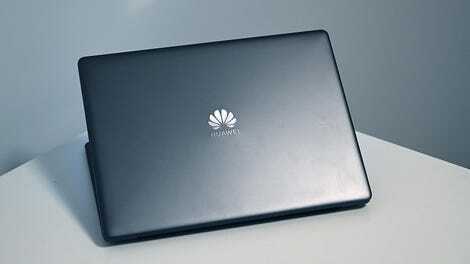 That’s because while the MacBook Air is limited to a 1.6-GHz dual-core Intel Core i5 CPU, Huawei’s machines comes with a faster quad-core chip (either Core i5 or Core i7). This makes the MateBook a better companion for anyone wanting to do a little number crunching or video editing on the side, while the optional Nvidia MX 150 GPU on the $1,300 Core i7 configuration even makes some light gaming possible. In Overwatch at 1,920 by 1,080, I averaged 50 to 55 fps with graphics on high and the render scale set to 100. That’s not stellar, but with a just a few setting tweaks, you can turn the MateBook 13 into a serviceable time-waster too. It’s a bit sad to see a normal webcam on the MateBook 13 instead of the sneaky pop-up webcam used on the MateBook X Pro, but in the end, its a good move for overall usability. As before, Huawei put effort into slimming down the bezels on the MateBook 13 (especially the bottom one), and it shows. For a relatively small system, the MateBook 13 features a massive touchpad. Unfortunately, the MateBook 13's proficient performance seems to come at the expense of battery life. Huawei claims the MateBook 13 should get 10 hours on a charge, but manufacturer expectations are always a little generous. On our video rundown test, the MateBook 13 only lasted 8 hours and 9 minutes, which is very average, and about an hour less than the MacBook Air (9:16). That gap in battery life might be enough scare to some people off, but when you look at the MateBook 13's overall value, everything snaps back into place. Starting at $1,000 for a Core i5 CPU, 8GB of RAM, and a 256GB SSD, the Matebook 13 costs $200 less than a base MacBook Air with a much less powerful processor and half the storage. And on the Windows side of the OS divide, it’s a similar story versus a new Dell XPS 13, which goes for about $200 more the Matebook 13 when loaded up with equivalent specs. Though to be fair, Dell does make a $900 XPS 13 with an i3 CPU and 4GB of RAM that Huawei can’t match. Also, unlike a lot of Huawei phones, the MateBook 13 will be conveniently available in the U.S. from Newegg and Amazon (and even Microsoft stores in a few weeks). And with Huawei finally caught up to the massive demand for the MateBook X Pro, it seems Huawei’s issues keeping retailers in stock shouldn’t be an issue either. The MateBook 13 isn’t flashy, and it doesn’t have the brand appeal or pedigree of systems like the MacBook Air or XPS 13. But it’s well built, well equipped, and a refreshingly straightforward take on what a portable, mainstream laptop should be. And the fact that it’s pound-for-pound one of the best values for a $1,000 laptop doesn’t hurt either. With a run time just north of 8 hours, the biggest downside of our Core i7 review unit with discrete graphics is just mediocre battery life. Only the left USB-C port can be used for data transfer and charging, while the right USB-C port supports data and video out via DisplayPort. Compared to the new MacBook Air and Dell XPS 13, an equivalent Matebook 13 is cheaper and offers a better value than both. The $1,000 i5 model comes is mystic silver, while the $1,300 i7 model with Nvidia MX 150 graphics sports a slightly dark space gray finish.